As a "King's Day Special" we are proud to have Michael Bolton, co-author of Rapid Software Testing, and Maarten Dirkse from bol.com as our guests. What is testing? What is the testing role? Is testing a demonstration that a product fulfills its declared functional requirements? If machinery can be programmed to check hundreds and thousands of functions in a second, do we need testers any more? 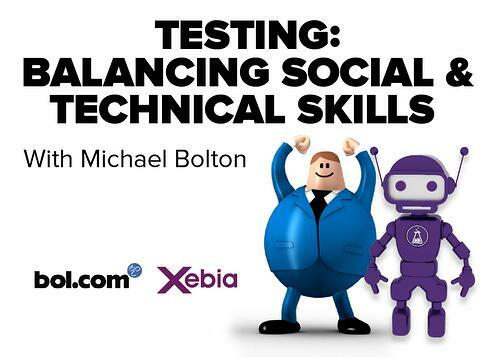 Michael Bolton says we do, but not so much to check for functional correctness—which arguably should never have been a central part of the tester's job in the first place. We need people in a testing role to do things machines cannot do: to think critically about software; to evaluate products by learning about them through exploration and experimentation; to explore and investigate risk and problems that threaten the value of the product. Can't developers do that? They certainly can—but shifting from a builder's mindset to a tester's mindset is effortful, time-consuming, or both. In this talk, Michael will explain why he believes that we still need testers when time is short and value is at risk. Maarten Dirkse will speak about the CI/CD setup at bol.com, how they managed to give teams control of hundreds of Jenkins jobs while still maintaining quality and stability, how software is deployed to production, and about Mayfly, then Continuous Delivery platform developed at bol.com. Click here to join, share knowledge and enjoy some good food & drinks!